PPT visuals for Turned Around and missionary lesson on Ringu of India's Forest, verse visuals ESV and KJV, teaching cards and suggested songs (see list below). PPT visuals and PDF files for the One Way and I Dare series. Includes visuals, texts, song visuals and sheet music for One Way, Stop, Go, and The 7MIT song, verse visuals (ESV and KJV), tokens, coloring sheets, Bible map, puppet scripts, study questions and other club organization tools, preschool lessons and helps. Spanish Bible verse visuals, token sheets and teaching cards are also included. 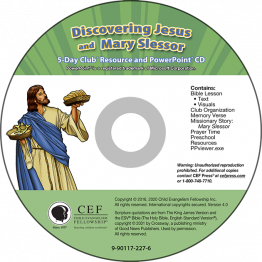 PPT visuals and PDF files for the Discovering Jesus and mission lessons on Mary Slessor. Includes visuals, texts, song visuals and sheet music for His Name Is Jesus and Have Your Heard?, and verse songs and visuals for memory verses Luke 19:10, John 3:16 and John 11:25, (ESV and KJV), tokens, coloring sheets, Bible map, puppet scripts, study questions and other club organization tools, preschool lessons and helps. Spanish invitations are also included. PowerPoint visuals for The Wordless Book Visualized include flashcard visuals, memory verses (ESV and KJV) and words to suggested songs. PDFs of lesson include text, visuals and review, mission teaching, reproducibles (quiet time sheets, memory verse bookmarks, coloring sheets, sheet music for songs)—everything in digital format that is in the printed resource pack.